Now you can read ComicBlitz digital comics on your iPhone as well as your iPad! Subscribers get all you can read digital comics available on your iOS device for just $9.99 a month! 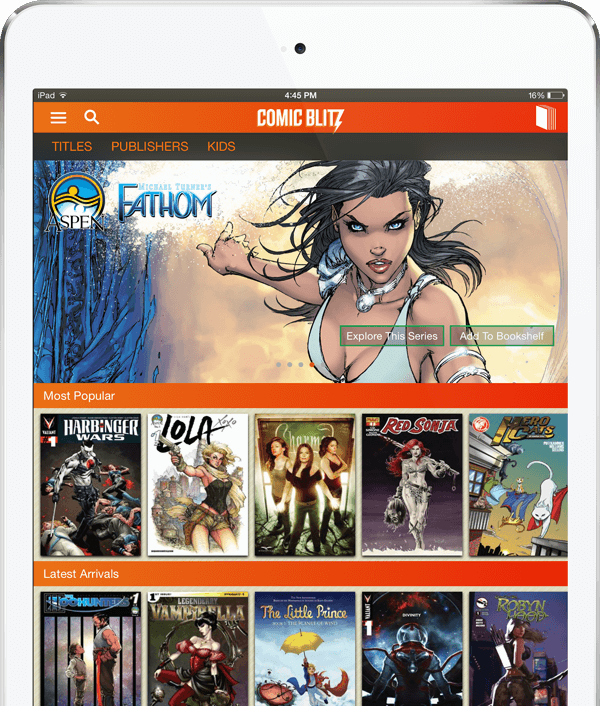 Los Angeles, CA – February 16th, 2016 – Expanding their reach from their launch device the iPad, ComicBlitz, the All You Can Read digital comic book app, is now available on iPhone as well. Users can now download, and sign up for the subscription service on any iOS device here: iTunes store. The iOS app gives subscribers unlimited access to more than 3,000 comics and over 75,000 pages of reading material from 17 publishers, such as Dynamite, Valiant, Aspen, Action Lab, Zenescope, Alterna for one low monthly price of $9.99. “We are very excited about launching our technology on new platforms that deliver content to more users. It’s been a fantastic start to 2016 and we are looking forward to things to come” says ComicBlitz CEO, Jordan Plosky. In addition, ComicBlitz has made it much easier for new customers to sample the app. “We have done away with asking for your credit card up front. Instead, we are offering customers free comics just for signing up,” says Plosky. “This way, you get to experience the platform before you have to commit to anything.” This sample provides new readers the ability to access all of ComicBlitz’s standard features, choose any free comics they want to read, add to custom lists, to their offline reading queue, and more. The ComicBlitz website has been overhauled as well. It is easier & quicker than ever to sign up, and perhaps even most importantly, the entire catalog is now available to view online. Customers old and new alike can now access every comic book cover, series count, and description on the ComicBlitz website, as well already a feature in the app. Some of the newer publishers to showcase their content on the platform are Darby Pop, a British duo of Markosia, and TPub, along with children’s publisher Capstone Press. New content is released weekly from existing publishers on the platform, such as popular titles James Bond: Vargr, Shaft, Bloodshot, Harbinger, The Boys, Fathom, and more. For updates, information, news and more, visit www.comicblitz.com.